What a scene this is. The previous Stairs scene (“He wants it!”) sets it up beautifully. And just look at that face! How could he have been so young and produced this performance? But I become tiresomely redundant. The book excerpt below the caps continues from the one in Pt. 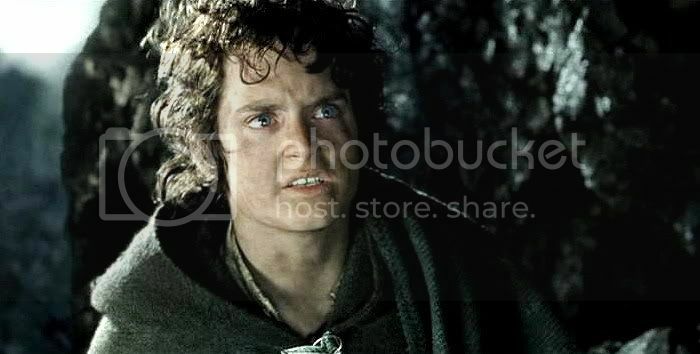 II and is a favourite of every Frodo fan. 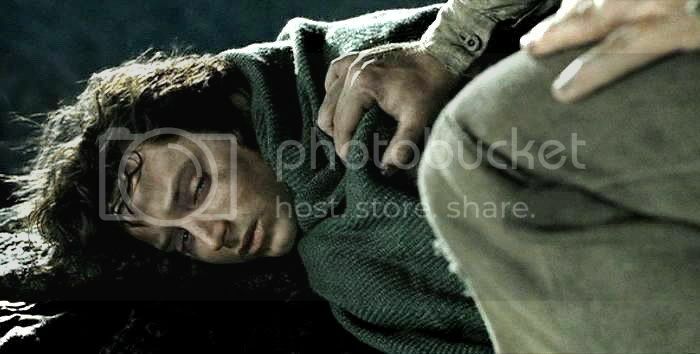 How radically the film departed from the book's narrative and themes is shown in this passage, in which Frodo and Sam together discuss the problem of Gollum, then drop off into sweet sleep, Frodo's head in Sam's lap. 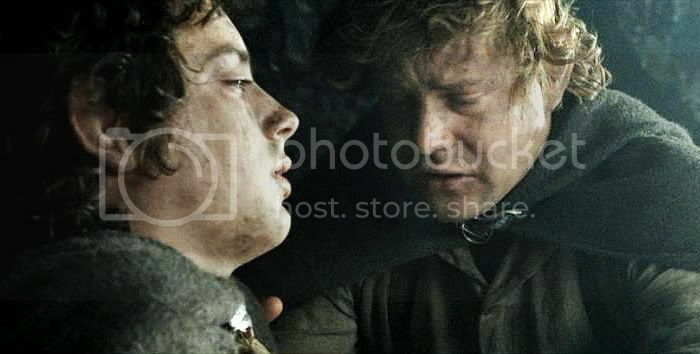 It is in this scene that Gollum comes closest to grace. High above the Morgul vale Gollum, Sam, and Frodo are shown lying on a series of jagged outcroppings on the wall of the stairs. 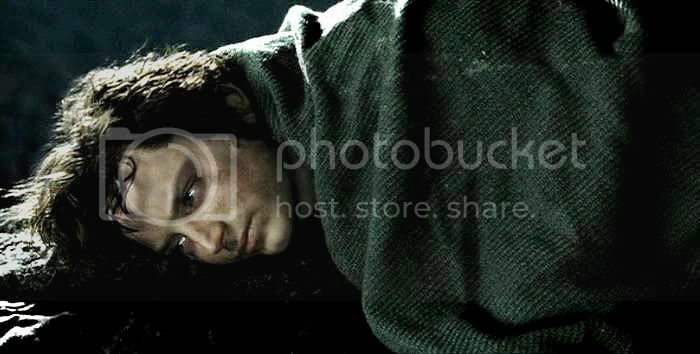 Frodo and Gollum sleep. Sam tries to fight it off but finally turns on his side, wrapped in his cloak. 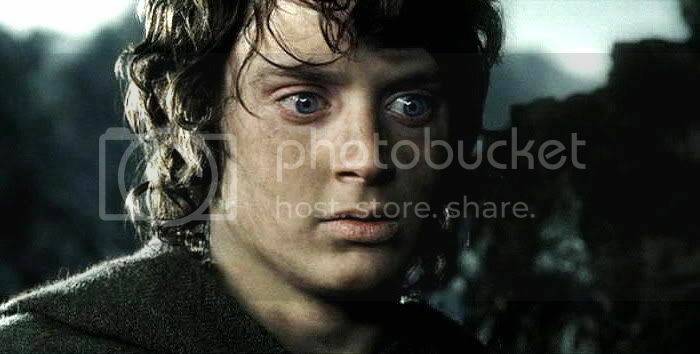 When his eyes close, Gollum’s eyes snap open. Stealthily he climbs down and reaches into Sam’s pack, taking out the leaf-wrapped packets of lembas. With an expression of disgust he takes out a wafer and crumbles it over the back of Sam’s cloak. He throws the rest over the edge and watches as it gently disperses into the depths below. Sam, as if sensing movement, starts and wakes. He sees Gollum looking over the edge, dusting his hands together. Sam: Where are you up to? Sneaking off are we? Sam: All right! All right! You just startled me is all. 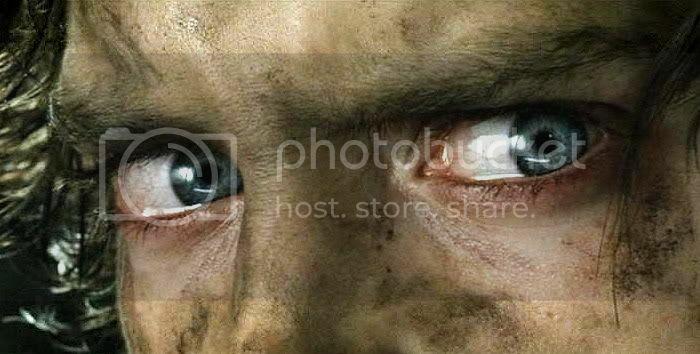 (Sam continues to look around distractedly, as if trying to remember something.) What were you doing? Sam: Fine. Have it you own way. 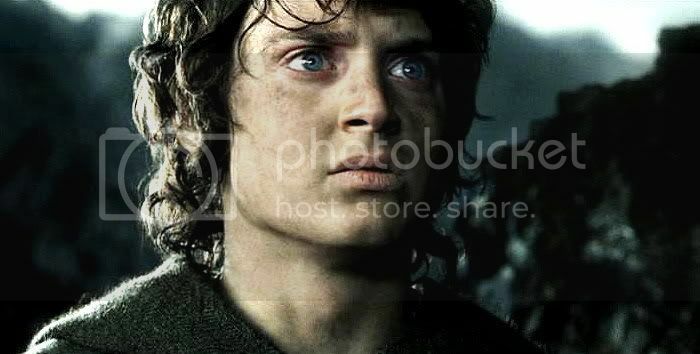 (Stooping and shaking Frodo gently by the shoulder.) I'm sorry to wake you, Mr. Frodo. We have to be moving on. 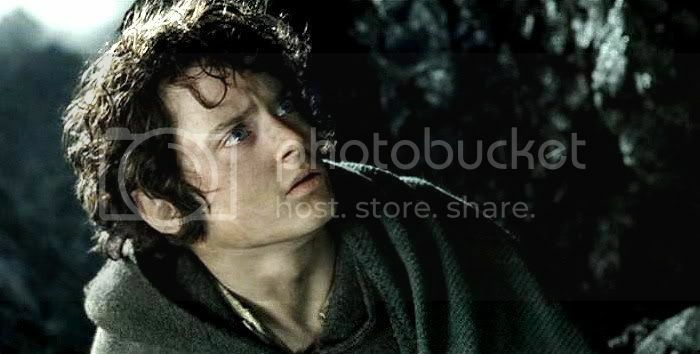 Frodo: (Looking up, obviously still exhausted.) It's dark still. Sam: It’s always dark here. Sam rummages in his pack, finding an empty mallorn leaf. Sam: It’s gone! The elven bread! 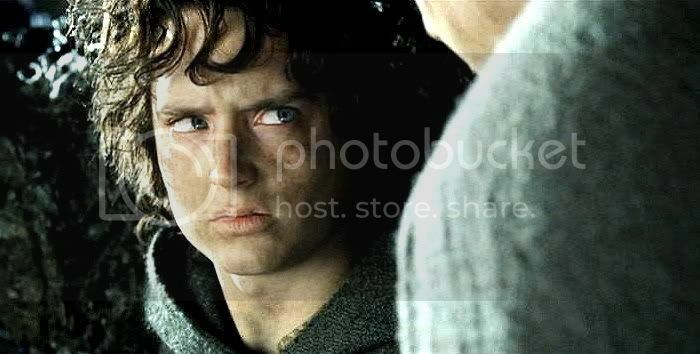 Frodo: What? That's all we have left! 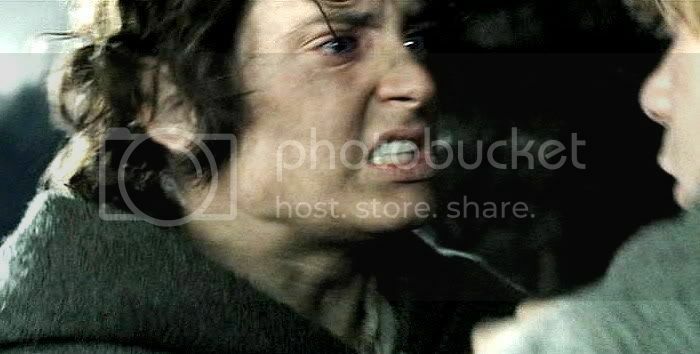 Sam: (Pointing to Gollum where he squats on a rocky outcropping.) He took it! He must have! Gollum: Sméagol? 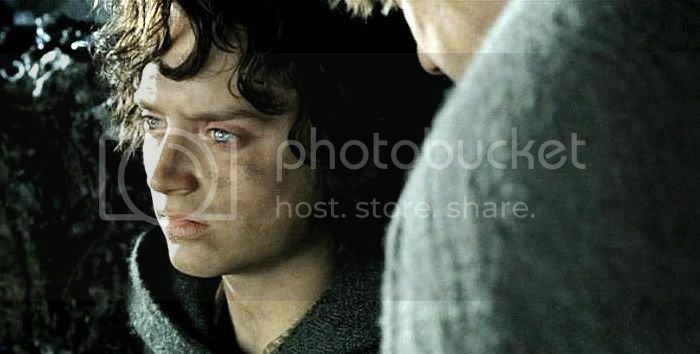 (To Frodo) No, no, not poor Sméagol. Sméagol hates nasty elf's bread. Sam: You lying rat! What did you do with it! 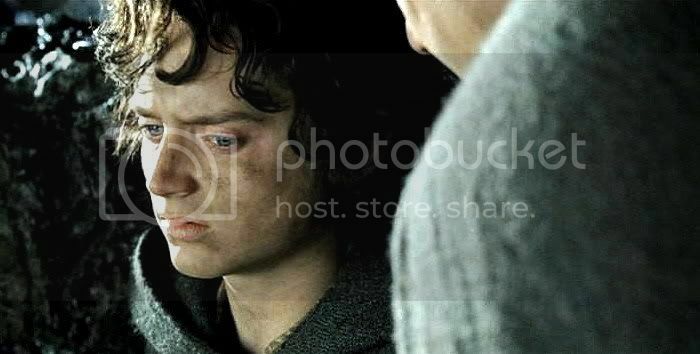 Frodo: He doesn't eat it. 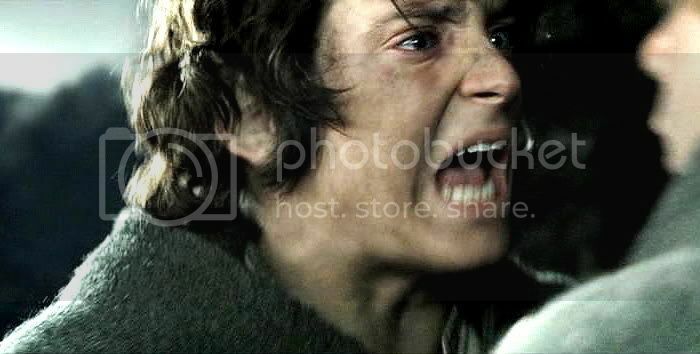 (Frodo gets up.) He can’t have taken it. Gollum: Look, what's this? 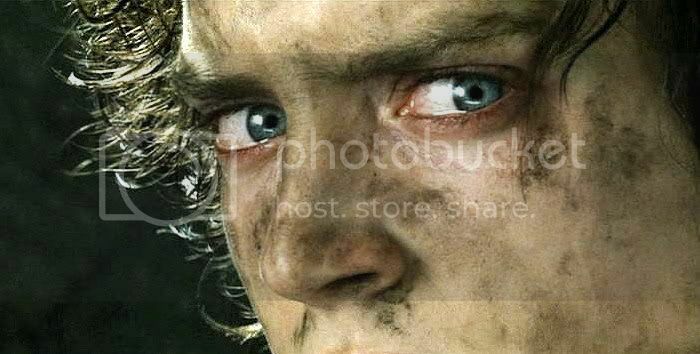 (Wiping crumbs off the front of Sam’s cloak and shirt then looking at Frodo.) Crumbs on his jacketsses. He took it. He took it!! 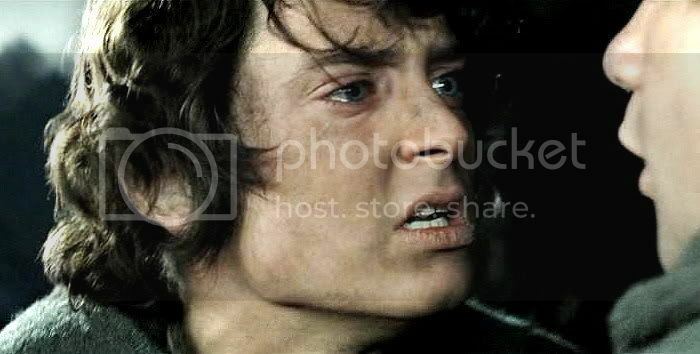 (Drops down to squat before Frodo.) I seen him. He is always stuffing his face when Master is not looking. Sam: That's a filthy lie! Ah! 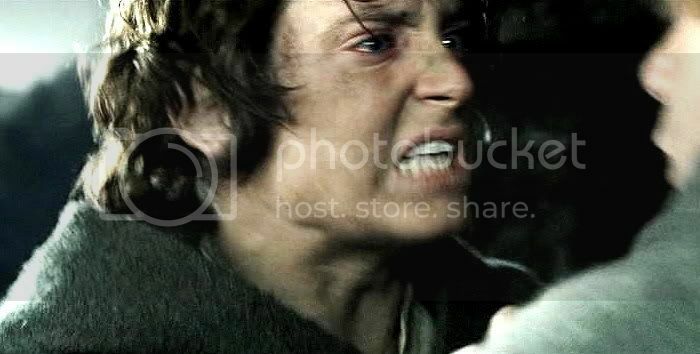 (Sam swats Gollum onto the rocks and goes after him, punching him repeatedly, beside himself.) You stinking two-faced sneak! 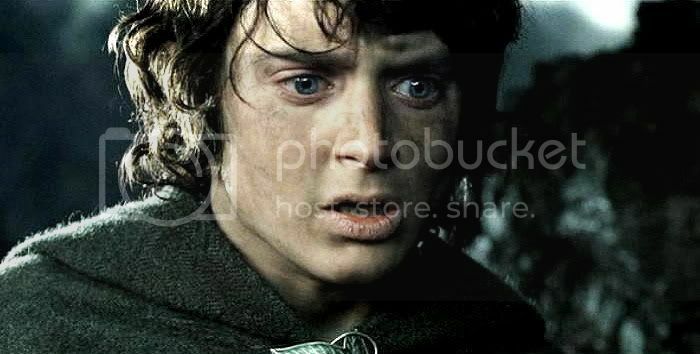 Sam’s voice echoes in Frodo’s head, saying, “…carry it for a while... 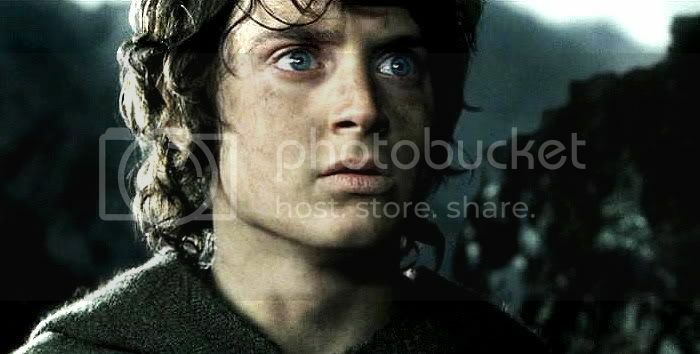 I could carry it... carry it... share the load... the load,” as tighter and tighter close-ups alternate between Sam’s lips and Frodo’s darkening eyes. Book scene: from The Stairs of Cirith Ungol. 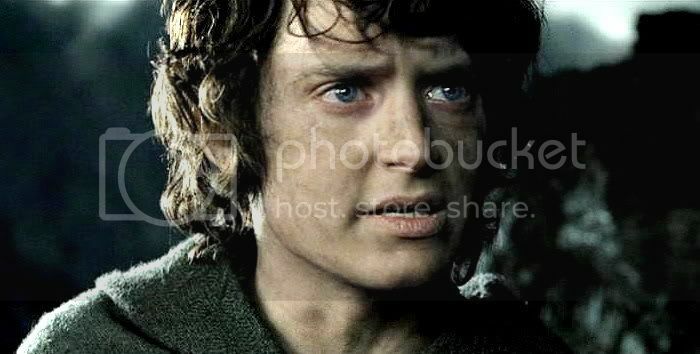 ‘We haven’t got there yet,’ said Frodo. And so Gollum found them hours later, when he returned, crawling and creeping down the path out of the gloom ahead. Sam sat propped against the stone, his head dropping sideways and his breathing heavy. 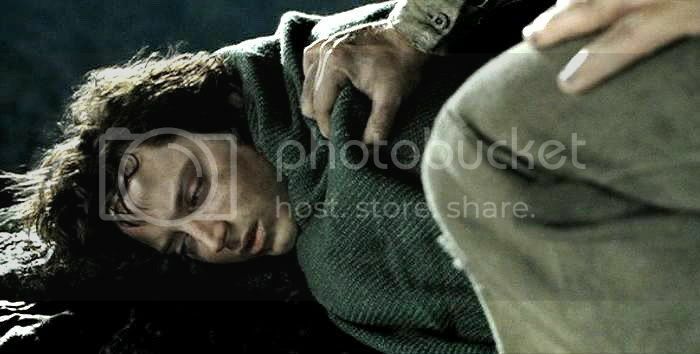 In his lap lay Frodo’s head, drowned deep in sleep; upon his white forehead lay one of Sam’s brown hands, and the other lay softly upon his master’s breast. Peace was in both their faces. Gollum looked at them. A strange expression passed over his lean hungry face. 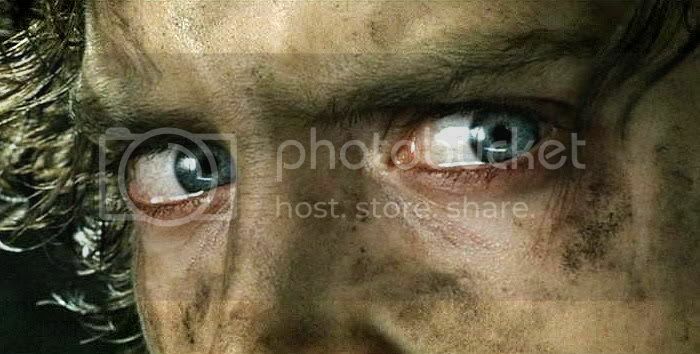 The gleam faded form his eyes, and they went dim and grey, old and tired. A spasm of pain seemed to twist him, and he turned away, peering back up towards the pass, shaking his head, as if engaged in some interior debate. Then he came back, and slowly putting out a trembling hand, very cautiously he touched Frodo’s knee—but almost the touch was a caress. 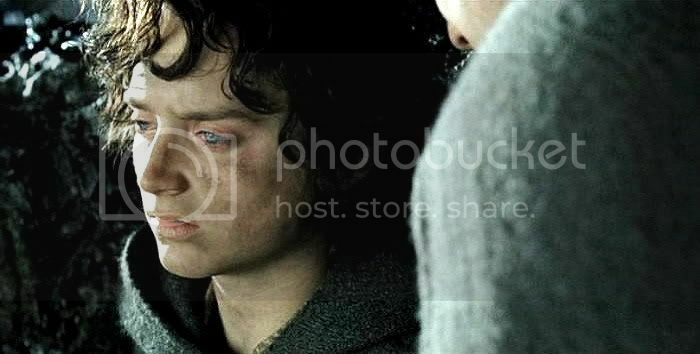 For a fleeting moment, could one of the sleepers have seen him, they would have thought that they beheld an old weary hobbit, shrunken by the years that had carried him far beyond his time, beyond friends and kin, and the fields and streams of youth, an old starved pitiable thing. 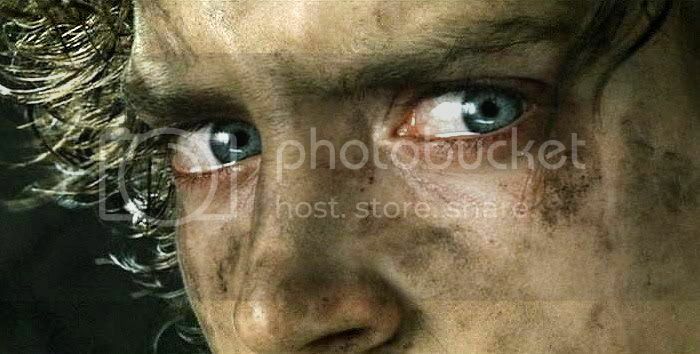 But at that touch Frodo stirred and cried out softly in his sleep, and immediately Sam was wide awake. The first thing he saw was Gollum—‘pawing at master,’ as he thought. ‘Sneaking,’ said Gollum, and the green glint did not leave his eyes. ‘I think we shall get tired of that word soon,’ said Sam. ‘But never mind. 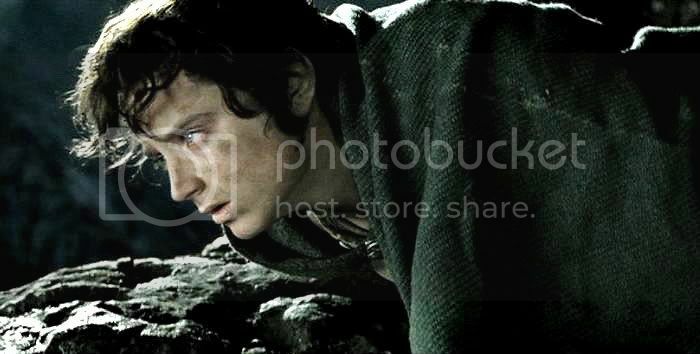 I’ll wake master up.’ Gently he smoothed the hair back from Frodo’s brow, and bending down spoke softly to him. "How could he have been so young and produced this performance?" He is a great actor, of course, but I can't help but believe that it was also because he was directed and supported by an outstanding group of people. All of the actors were spurred to excellence due to this, IMO. I think you are right, Primula, especially after watching the subsequent films of these actors. It was a blessed time. I feel so lucky to have seen these films in theatres, on the big screen, when all of the genius of these films (the works of so many, many artists) was coming together so beautifully. Yes, Mews. I can see all those permutations on his face too. 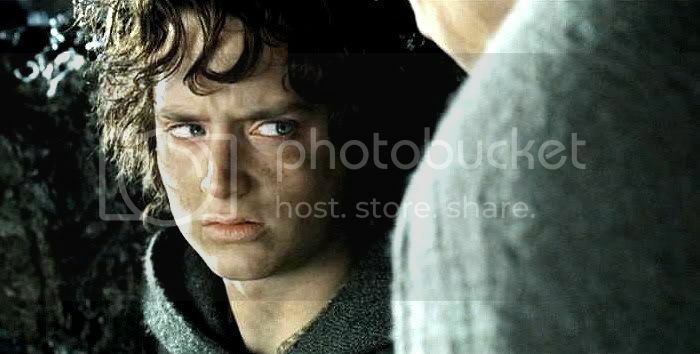 But considering how many later scenes between Frodo and Sam were directed by Fran Walsh, I wonder if we should be thanking Peter Jackson for directing this particular moment? One day I hope they publish a log of all the filming days, showing what was shot when. But even if P.J. was not there himself, he had poured so much into the planning and oversight, he still gets credit. The screencaps are to die for, great work, sunhine! Thank you, Julchen! He really does amazing work in this scene, unorthodox as the scene is. I just love watching it, and love the caps.